It’s pretty simple. 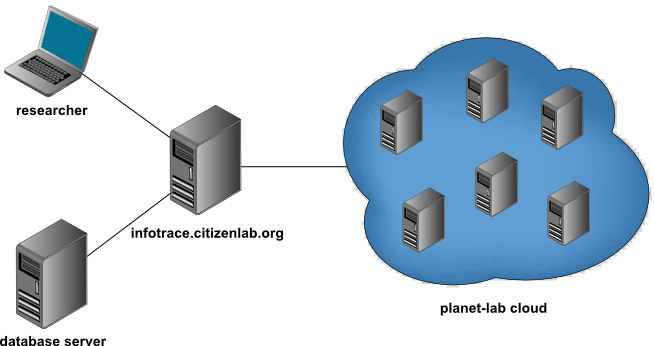 infotrace.citizenlab.org (DNS isn’t working yet) is running django and a postgreql database; the database could easily be split off to another machine if load requires it. Queries will be generated by researchers accessing the web interface, and will be sent off to the Planet-Lab “cloud”. Most of the dirty work there will be done by the various Planet-Lab API’s I’m still trying to get my head around. This should mostly be taken care of with django’s admin module, but I figured it was important to write up as well. other types which I’m not thinking of?